Mark H. Anbinder | Posted about 1 year ago. Peggy Lynn and Dan Duggan are performing this weekend on WVBR’s Bound for Glory. The longstanding Bound for Glory weekly concert series begins its “spring season” this Sunday night with a free show featuring Dan Duggan & Peggy Lynn. Now in its 51st season, the weekly show is on WVBR from 8-11pm and has three live sets at Cornell’s Anabel Taylor Hall. “They sing as though they have performed for a lifetime together,” said Buffalo Friends of Folk Music of Duggan and Lynn, who often perform with Ban Berggren as the Jamcrackers. 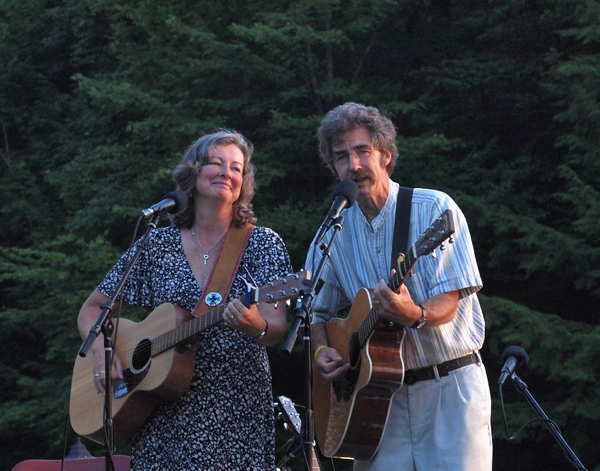 Peggy and Dan have released several duo recordings, including “Keeping Christmas,” “A Stitch in Time,” “Grandsongs,” “Jamcrackers,” with Dan Berggren, and “Be the Light.” Their most recent recording, released in 2013, is “Esperance,” named for their farm in Red Creek, New York. Founded in 1967, “Bound for Glory” is North America’s longest-running live folk concert broadcast, and has been hosted by its creator, Phil Shapiro, for the entire five-decade run. Broadcast during the Cornell University school year, “Bound for Glory” presents more than 30 live concerts over the course of their season. Shapiro began the show the same year that Woody Guthrie died, taking its name from Guthrie’s autobiography, as an homage to the late folk legend.